The WeMadeThis group promotes community spirit by organising monthly Maker Days at city-centre locations, pictured is St Stephen’s. 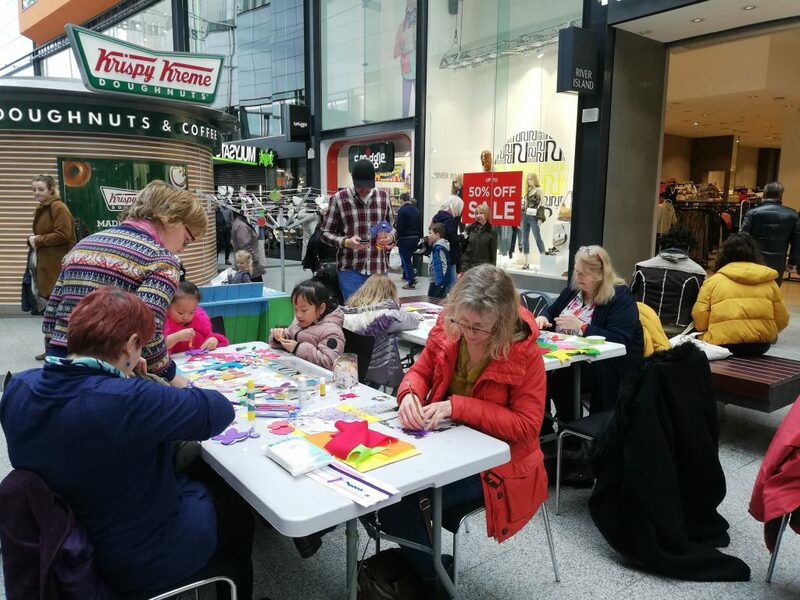 Hull-based community group #WeMadeThis has been busy these past few months, making flower garlands for their fifth large-scale craft project, #WeMadeThisSpring. Hundreds of local people have been involved in the creation of well over 500 garlands, which are going to go up in dozens of places across the city (and beyond) this Saturday (23 March) to celebrate the start of spring. The garlands will stay up until 6 April. Unlike their Christmas Tree projects, #WeMadeThisSpring will not be accompanied by a map of all the locations where you’ll be able to find the garlands. However, the group have been putting up these posters where garlands will appear, so keep an eye out, and feel free to take a pic and share where you’ve spotted them. As is customary by now, participants in the project cover a range of ages and abilities, with groups involved including four nurseries, nine schools, two after school clubs, six craft groups, a residential home and other community groups and organisations, such as the Rainbow Community Garden off Endike Lane, the Garden Village Neighbourhood Watch and Dove House Hospice. Even though the flower garlands are yet to go up, #WeMadeThis are already looking ahead to their next project, which will see them host another Hull-themed exhibition at Hull Minster, following the success of their Hull Spirit: Iconic People and Places exhibition last year. This year’s exhibition will have Trailblazers as its theme, and will take place between 10 and 29 September. To get involved, follow #WeMadeThis on twitter, Facebook and Instagram @wemadethishull, join the Craft Project Hull Facebook group, or drop us a line at wemadethishull@gmail.com. Be the first to comment on "Crafters help Hull burst into flower with WeMadeThisSpring"